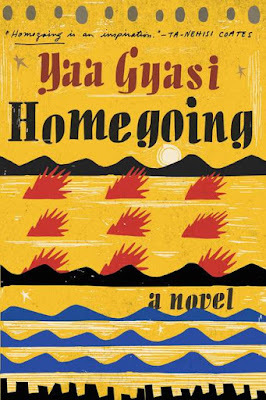 This month, the book club selection for the Beyond Words Bloggers' Book Club was "Homegoing" by Yaa Gyasi. When this book was recommended, I had no idea what it was about. The Goodreads description describes it as "The unforgettable story of two half-sisters, separated by forces beyond their control: one sold into slavery, the other married to a British slaver." I didn't think much of the book when I downloaded the audiobook and started listening to it. I don't listen to audio books often, but I'm so glad I did listen to "Homegoing." It was beautifully told. This book truly came to life through the audio book. Within the first chapter, I was hooked, and then, the Cape Coast Castle was introduced and I immediately felt like I was back in Africa. 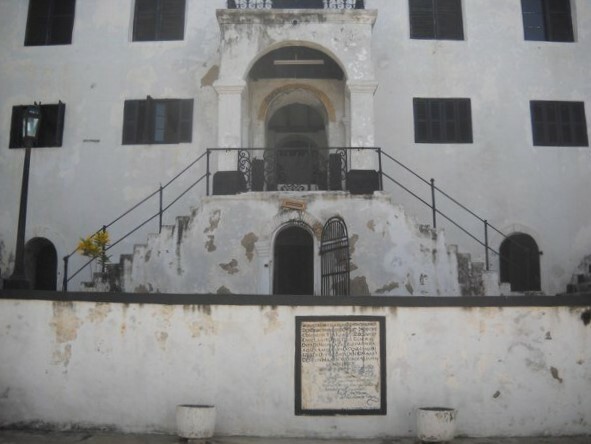 Much of this book takes place at the Cape Coast Castle, or with the castle as an important figure in the novel, and rightfully so, as the castle was one of the most prominent in the slave trade. 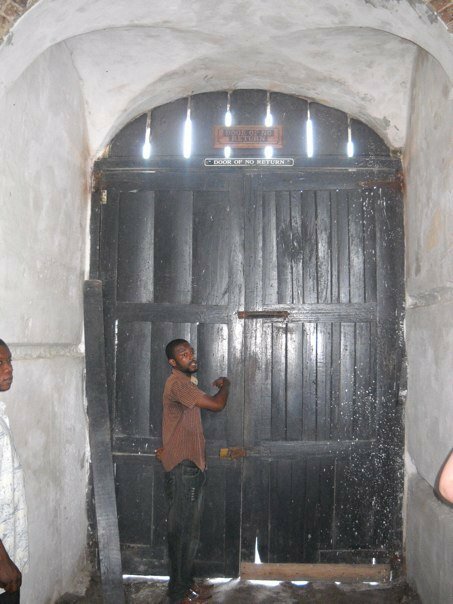 I traveled to Accra, Ghana in 2009 and visited two slave castles - the Cape Coast Castle and the Elmina Castle. 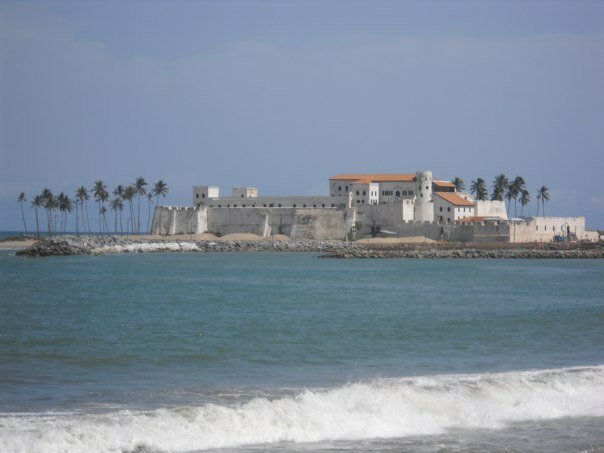 These "castles" are both on the water and served, not only as fortresses that housed the colonists but as prisons where slaved were held before being loaded onto ships and sold across the Caribbean. Known as "the gate of no return," these castles were the last stop before crossing the Atlantic. Instead of sharing what I've been reading this month, I'm going to share about "Homegoing," along wit photos from my trip to Ghana in the hopes that this book will come to life as much for you as it did for me. "Homegoing" was phenomenal. I couldn't get enough of this book. I listened to it in the mornings, the evenings, while I was running...I couldn't stop. The story begins in the late 1700s at the height of the slave trade with the stories of Effia and Esi, half-sisters born in different villages in Ghana. Each chapter follows their lineage across Africa and the U.S., ending in the present day with the very real exposure of slavery's legacy on African Americans today. I felt like this book read more like individual short stories that all tied together. There were stories that were beautiful and others that were heart-wrenching, but at the very core of this story, it is a very real truth. 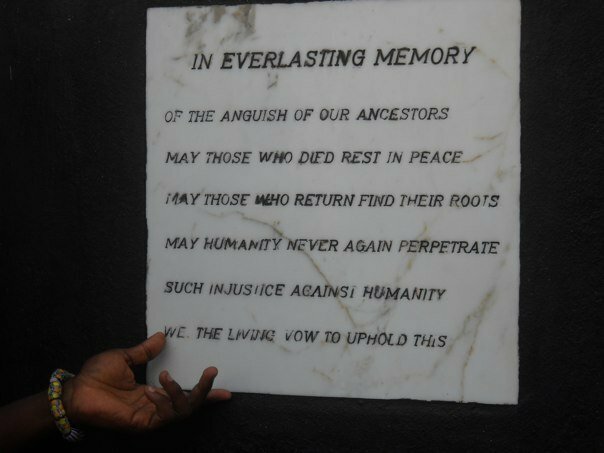 This is the story of the slave trade, encapsulated in characters whose histories are so deeply rooted in this horrific part of our human history. One of the things I loved most about reading this book is how reminiscent were the words in Ewe, Ashanti, and Fante. 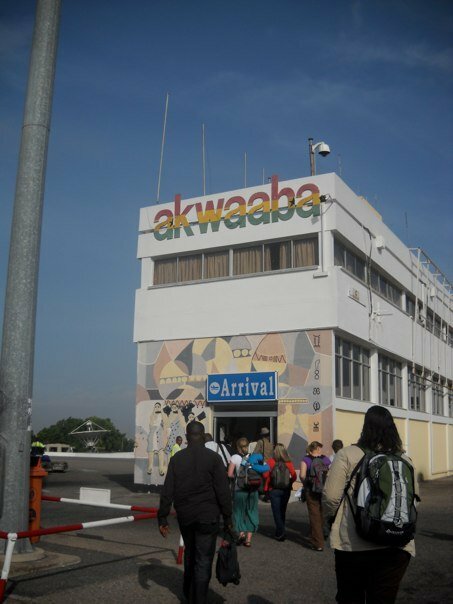 For example, Akwaaba means "Welcome," and is used throughout the book. When you arrive in Accra, the same phrase greets you at the airport. As described in the book by Marcus, this phase of welcome greets you everywhere you go, at the markets, at museums, at tourist sites. I love it because, it's so much more of a welcome than a simple, "Hello." It's quite obvious that I'm not Ghanaian and so, instead of saying, "Hello," I was welcomed by everyone I met. Some of the characters in the books, Abena, Yaw, Amena, and Akosua are very familiar names. In Ghanaian culture, children are named for the day of the week they are born. They are often given a middle name which is their more commonly used name, but I remember by Ghanaian friends christening me, "Akosua" because I was born on a Sunday. I hadn't thought of this in years and I loved reading these names and remembering. I mentioned that this book truly came to life for me, so to share that experience with you, I'm going to use some of Yaa Gyasi's words to describe the castle, as I think she's such a brilliant writer and will do the castle more justice than I might be able to. "This is where the church was.," the rubber band man said, pointing. "It stands directly above the dungeons. 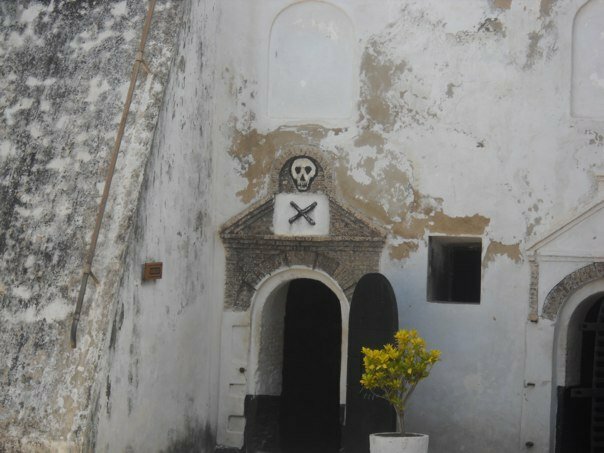 You could walk around this upper level, go into that church, and never know what was going on underneath." "In fact, many of the British soldiers married local women, and their children, along with other local children would go to school right here in this upper level." "And soon they were headed down, down into the belly of this large, beached beast. Here, there was grime that could not be washed away, green and gray and black and brown and dark, so dark. There were no windows. There was no air. " "This is one of the female dungeons," the guide said finally, leading them into a room that still smelled faintly. "They kept as many as 250 women here for about three months at a time." "From here, they would lead them out this door. He walked further. The group left the dungeon and walked toward the door. It was a wooden door painted black, above it, there was a sign that read, 'Door of no return.' "This door leads out to the beach where ships waited to take them away." The dungeons were terrifying and, yes, they did still faintly smell. They were so dark. You can see from the pictures above, that they aren't very large. 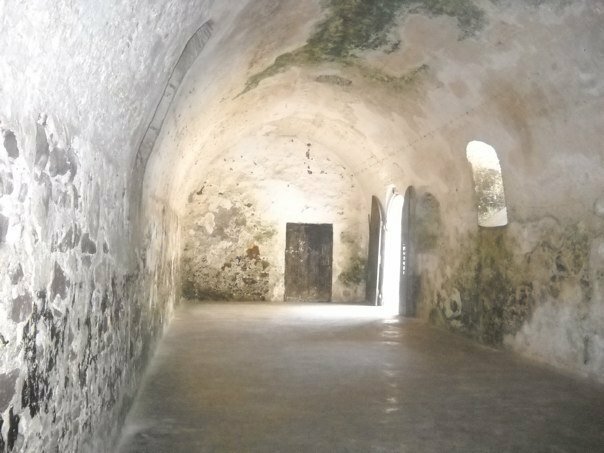 Of the two photos I have of the dungeons, the second one shows a lot more light, but once those doors were closed and the windows were barred, darkness engulfed the space which comfortably held about 40 people. If I'm not mistaken, I believe this upper-level dungeon was used as a placeholder where people were kept while ships were boarded before they went into the dungeons. I can't imagine what it was like to be shoved in a room that size with 250 other people. 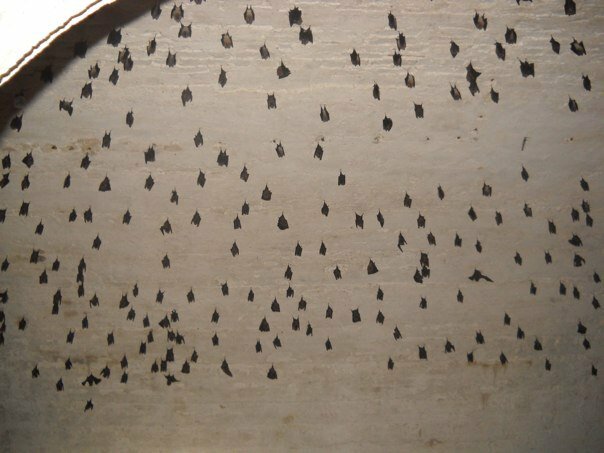 I don't know if it was like this when the castle was in use, but when we were there, the ceiling of one of the dungeons was covered with bats, which was tremendously unsettling. The view outside the "Door of No Return" was breathtaking. It's shocking to think of those who walked through this door must have felt to see sunlight for the first time in three months, see the beauty of the Atlantic on the Gold Coast, and then board a ship to a life unknown. 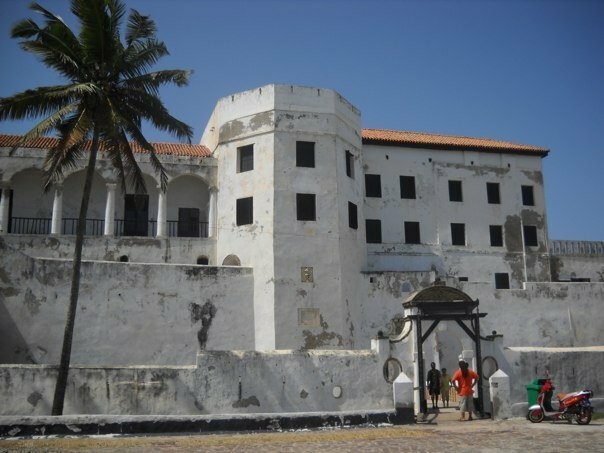 The Cape Coast Castle was built to be an impenetrable fortress. While small in size, you can see how thick the outer walls were. 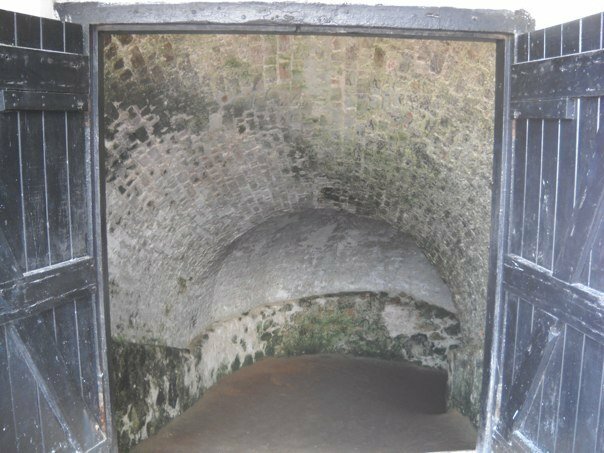 Even if someone could escape the dungeons, they would be in the middle of the courtyard, surrounded by walls layers deep. 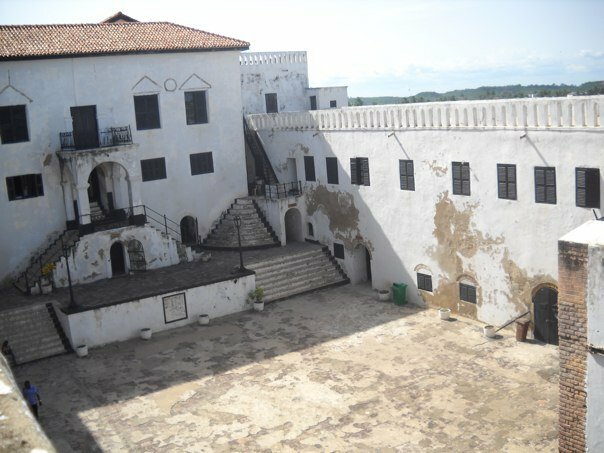 Inside the castle, today, there is a museum that teaches about the slave trade from the African perspective. They even had an auction block. The castle wasn't meant to mistake any realities. Unlike modern slavery, where people fall victim to fraud or coercion, there was no mistaking the fate of those in the castle dungeons. This sign clearly indicates the fate of those who were sent into this particular dungeon, which was reserved for those who had to be punished. They were locked in this dungeon without food or water until they died. 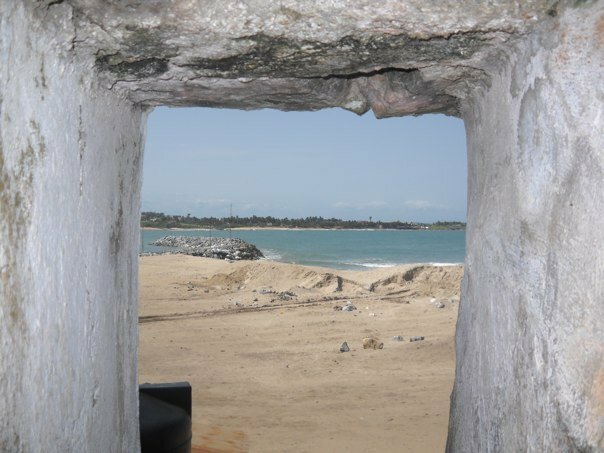 I know this hasn't been a traditional book review, but I really hope you enjoyed these pictures and my own experience traveling to the Cape Coast Castle. It's been 7 years since that trip and I think about it often. 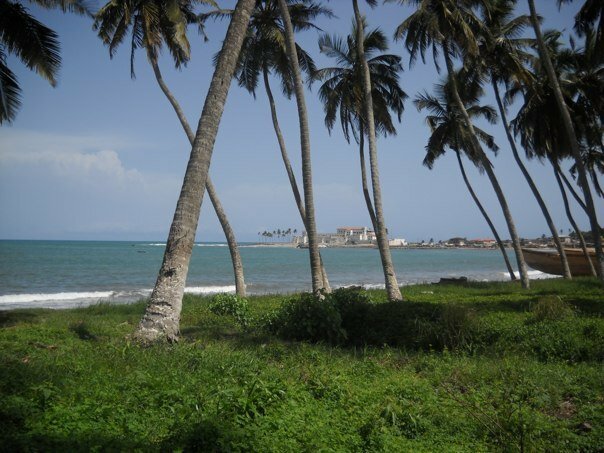 I loved Accra. Visiting the slave castles gave me so much more perspective into American history than any history class I've ever taken. There's a conversation in this book where Yaw is teaching his students what history is and makes the point that it is the survivors who get to tell the story. In this instance, that's certainly true, but visiting the castle gave me the opportunity to experience the other side of the story. If you haven't read, "Homegoing," I highly recommend it. This is a truly beautiful story that needs to be told. If you did read it, tell me what you thought and link up with us today! If you're part of the book club or want to be, our next book is "The Pearl that Broke its Shell." We'll be linking up again on November 25, which is Black Friday! We'll be skipping the month of December since our link up falls in the middle of the holidays, but we'll pick the January book in November so that everyone has two months to read the book (and wait for any library holds to release!). 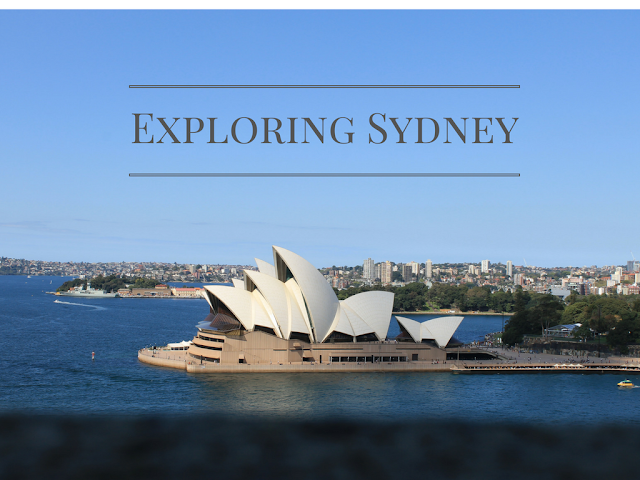 I'm picking things up with our trip to Australia by starting off where we did - in Sydney! 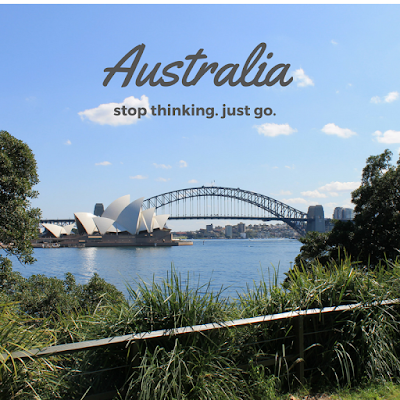 Sydney is the most obvious starting point for any trip to Australia from the U.S. I know that Quantas does a flight from LA to Melbourne but all other airlines only fly to Sydney. When we arrived in Sydney, it was the first nice weekend of spring. It was a little cold for me coming from DC summer but everyone was enjoying the first weekend of warmer weather and it was a great atmosphere. I have never in my life seen so many runners out and about in one city! Day 1, Friday: We arrived in Sydney after a glorious first class flight and made our way to our AirBnB in Darlinghurst on the edge of Paddington. Darlinghurst was an adorable neighborhood with tons of shops and restaurants and fairly central to the city. I had been nervous about staying there because it was outside the Central Business District (CBD) but after a few days exploring, I realized that we made the best choice possible as the CBD feels more like NY'S financial district, mostly being office buildings and a few hotels and virtually shutting down on weekends. We got to our place, freshened up, and decided to walk to the Sydney Harbor. Our hosts told us about a great bakery in the neighborhood which we stopped at for a quick bite. Kurtosh is named for traditional Hungarian pastries that are a cross between a pretzel and a croissant and are delicious! 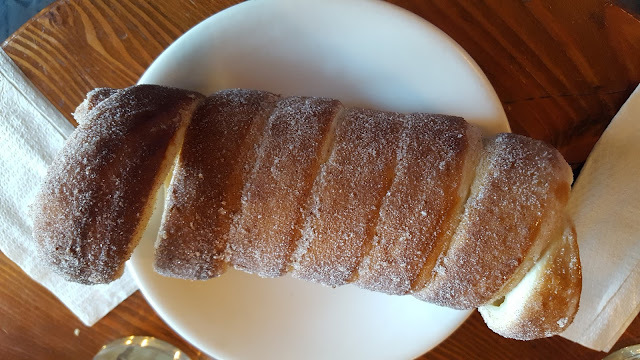 We opted for the cinnamon sugar and it didn't disappoint! Properly fed, we made our way to the Botanical Gardens and wandered through the gardens toward Sydney Harbor, where we caught our first glimpse of the famed Opera House, and it was ten times more magical than I thought it would be. We kept walking through Sydney Harbor and eventually made our way further into the CBD to pick up a free walking tour we had read about. The tour lasted three hours and was a fantastic introduction to the city! 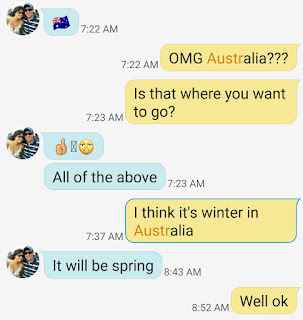 We learned so much about Australia's history, which I really didn't know much about. We learned about Australia's convict past, their Victorian inspiration, and aboriginal history. The tour was incredible and totally free (they ask for tips at the end, which we were happy to give!). Our tour finished right on the Sydney Harbor, giving us the chance to see the Opera House at night. We walked a few blocks through The Rocks (an old, historic Sydney neighborhood) and had dinner at the Harbor View Hotel (which is not actually a hotel, as most "hotels" in Sydney are actually just bars). I had a pumpkin ravioli which was out of this world! Pumpkin was very much in season all over Australia, which was so weird to wrap my head around as it was their late winter/early spring! By the time we finished dinner, we were exhausted. I actually fell asleep on the metro home! Thankfully, The Pilot was able to stay awake so I didn't get lost somewhere! Day 2, Saturday: We were up pretty early since we had gone to bed early and started our morning with a quick "brekkie" at a great little coffee shop in the neighborhood. We had pineapple carrot cinnamon muffins, which I'm dying to recreate! This fueled us up for a perfect morning run in Centennial Park. It was amazing! 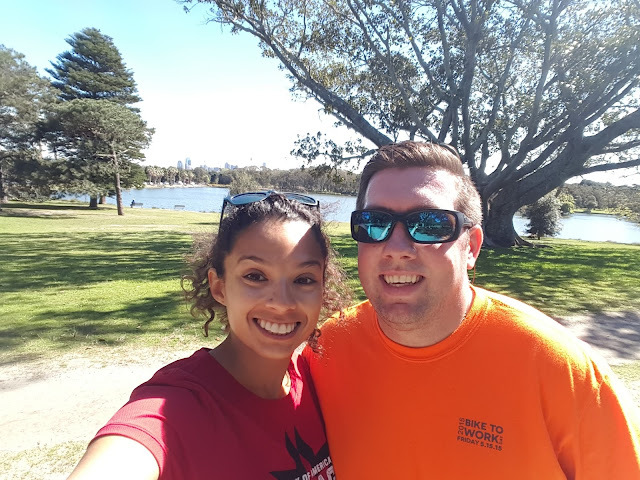 We did a full loop of the park and I loved being in the park on a Saturday morning and seeing what all of the Sydneysiders were up to! There were so many runners out and about, people on horseback, or teaching their kids to ride bikes...it was the first spring-like weekend of winter, and everyone was out soaking up the sun! We finished our run in Paddington and walked through the adorable Paddington Market before heading back to change and then making our way (via ferry!) to the Taronga Zoo. 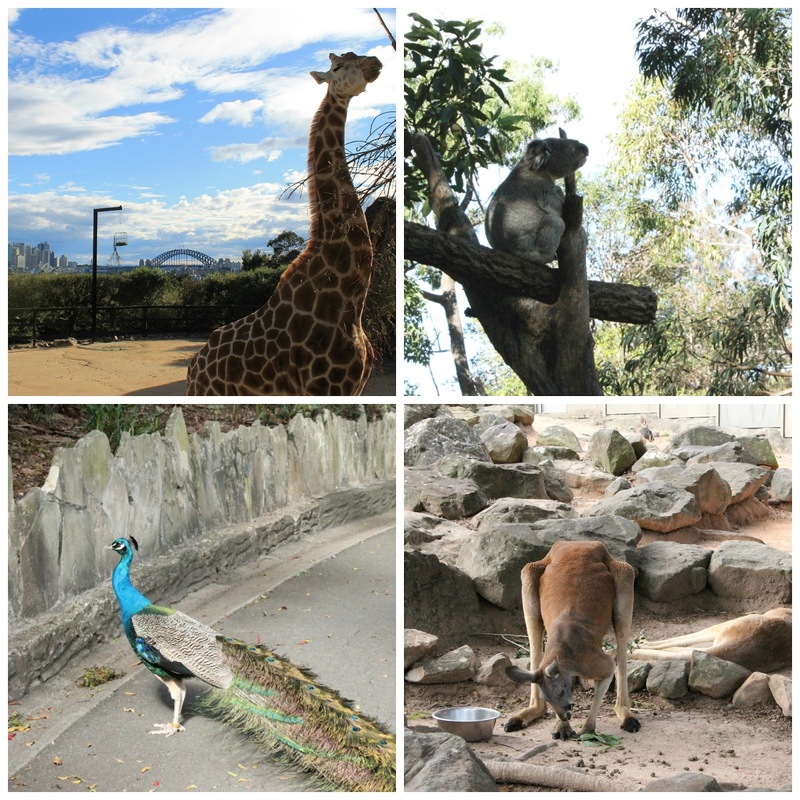 The Zoo was my absolute favorite part of Sydney! One thing about the ferries - they're on the same system as the Sydney metro, so they're really inexpensive! I read a lot of recommendations about taking a Sydney Harbor cruise, but they were so expensive! 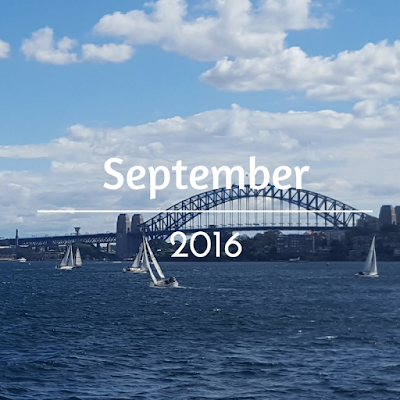 You can definitely catch the same views on a Sydney Harbor ferry for a fraction of the price! The Zoo was amazing! The price was pretty steep ($45 AUS/person) but I loved it! The giraffes have the best view in all of Sydney and the koalas melted my heart. I think Taronga deserves its own post, but here are a few highlights from our trip! The peacocks aren't zoo animals, they just hang out all over the zoo! Day 3, Sunday: We started our Sunday with coffee (flat whites) and donuts at Infinity Bakery. We had been eyeing Infinity's donuts for days and finally, couldn't resist the temptation! Banana cream pie donuts with salted caramel. YUM! Fueled up, we took the bus to Bondi. We stopped in at Gertrude and Alice, a famous bookstore (because I couldn't resist), and wandered around Bondi Beach. It was the Bondi Kite Festival and we saw so many beautiful kites! Bondi was awesome and the Bondi to Coogee Walk definitely merits another post! These are a few shots that capture just how awesome Bondi is! We took the bus from Coogee to Darling Harbor, which was kind of a disappointment. 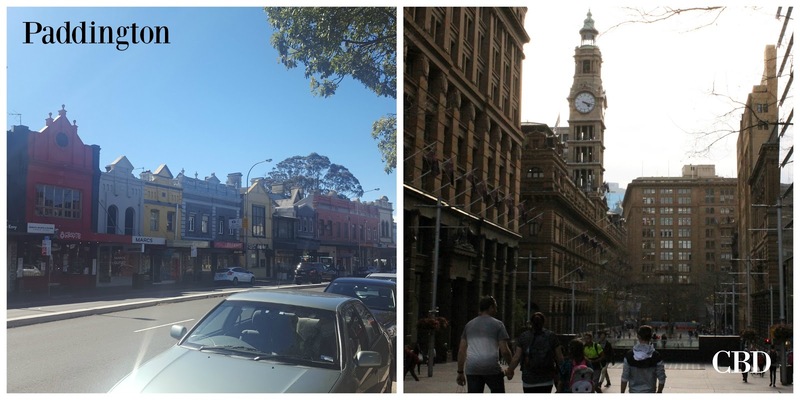 It's a newish area of Sydney and reminded me more of Downtown Disney than an actual neighborhood. We wandered through there and then picked up a ferry to Sydney Harbor and caught the most immaculate sunset I've ever seen! We found ourselves back in The Rocks where another free walking tour, specifically of that neighborhood, was taking off and we decided to join it. This tour wasn't as great as the first one we went on but was still fascinating. 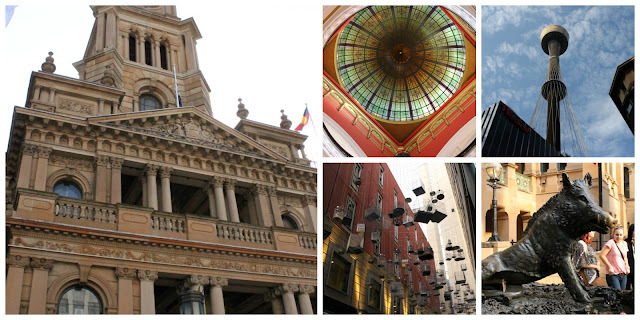 The Rocks is Sydney's oldest neighborhood and has a lot of really interesting history! We had dinner at a delicious restaurant called Pony and called it a night. Day 4, Monday: Monday was our last day in Sydney and, while were planning to leave the city for the day to hike the Blue Mountains with my friend, Claire, we decided it against it after realizing that it was the type of day trip that really merited renting a car, rather than taking the train. 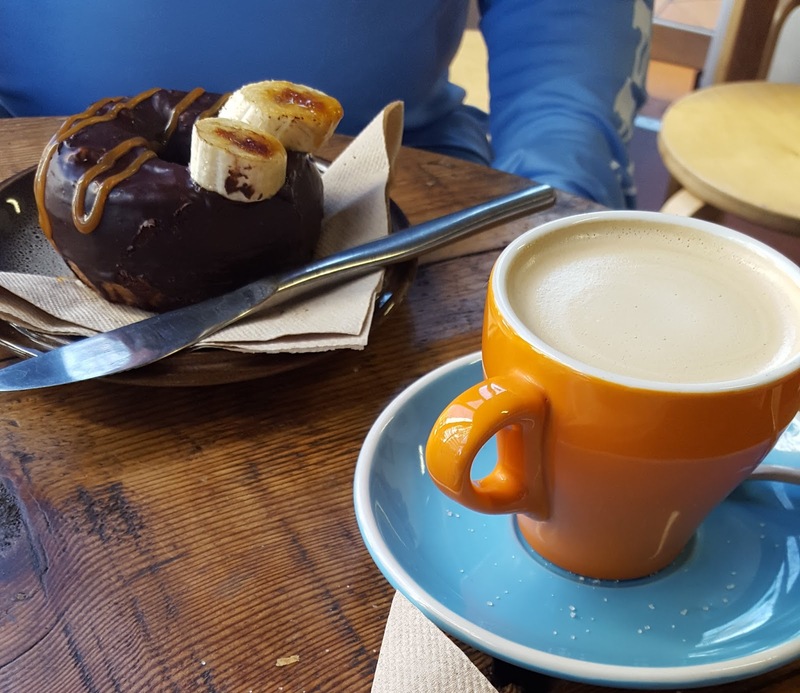 We started the morning with breakfast at Bill's, a local neighborhood restaurant that has been in Darlinghurst for over 25 years, and were not disappointed. We had one of their specialties, scrambled eggs and sourdough toast, which sounds simple, but was out of this world. I was disappointed that we didn't find Bill's until our last day there because it was unbelievable! I think it took us almost 20 minutes to order because everything looked so good! 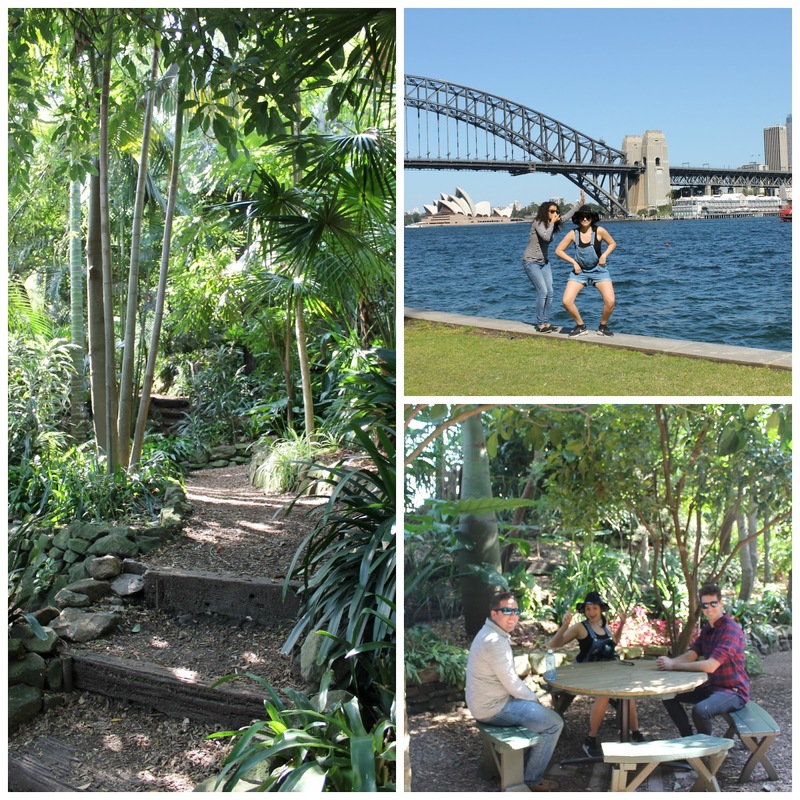 We left breakfast and walked back through the Botanical Gardens to Sydney Harbor before meeting up with my friend, Claire. Claire and I met almost 10 years ago on a backpacking trip through Ireland and have stayed friends since. She's visited me in the states a few times, and I finally repaid the favor! 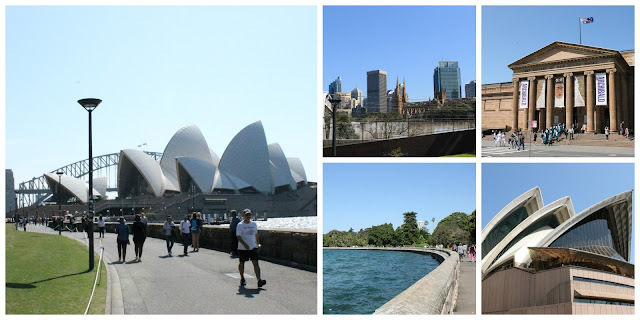 We walked back to Sydney Harbor and met up at Custom House, an awesome spot that is also a library and then walked the Sydney Harbor Bridge (which was, honestly a disappointment, as the railings prevent you from really seeing anything) into Kirribilli. This is the only picture I got from the Sydney Harbor Bridge. It's a nice shot, but it was the only picture I was really able to take, and this was after sticking my camera through the bars to get it! 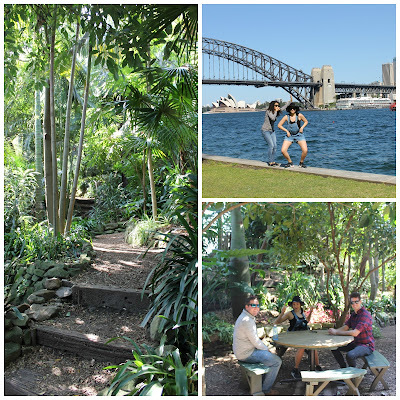 We met up with a friend of Claire's in Luna Park who took us through some really cool parts of Kirribilli. We wandered down to Milson's Point and Lavender Bay and then made our way back. Claire had to head out but her friend had given us tickets to Luna Park, so we wandered in and rode the Ferris Wheel and visited the Fun House! The Ferris Wheel offered a great view of the Sydney Harbor Bridge! We took the ferry to back to Circular Quay and then wandered around the CBD, stopping in the Queen Victoria Market for some delicious macarons, and spending an absurd amount of time in a bookstore before heading back to Darlinghurst. We had dinner at Malabar, an unbelievable South Indian restaurant that transported me back to Bangalore. I haven't been able to stomach Indian food since I came back from India five years ago, but most Indian food in America is North Indian and I about died over the masala dosas that reminded me of South India! We made our way back to our apartment and spent the night on the roof with our AirBnB hosts and some friends of theirs. 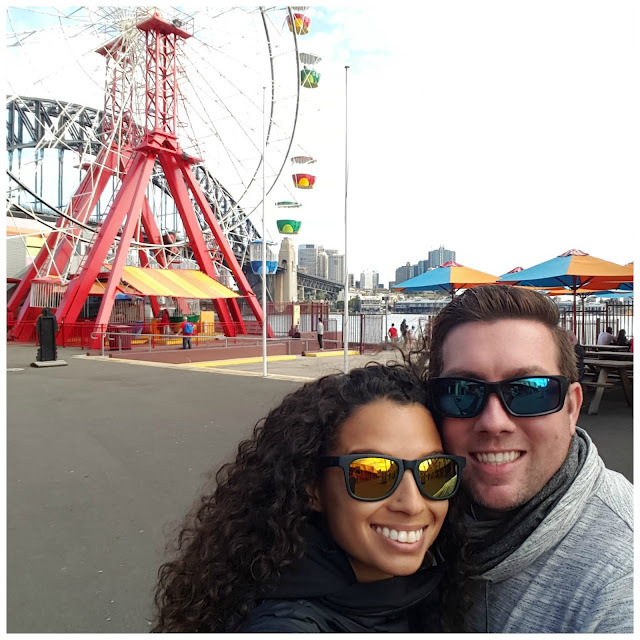 Our trip to Sydney was phenomenal! Of course, when we left Sydney on Tuesday morning, we really didn't know we would be back, but I loved it! Sydney has an unbelievable culture and everyone was so nice. Everywhere we went, the food was amazing, and we really just couldn't get enough of Sydney Harbor or it's fantastic sunsets! I loved being in Sydney for the first weekend of spring, but it was time to wrap up our stay and venture up north to Cairns! 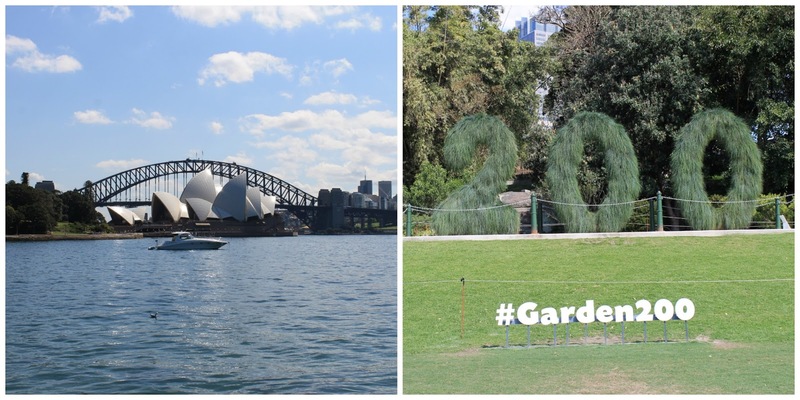 I can't wait to share the rest of our trip with you: more about Sydney including the Taronga Zoo and the Bondi to Coogee Walk, our whirlwind trip to Cairns to visit the Great Barrier Reef, and our trip to Melbourne! What do you think of our time in Sydney? Did we miss anything? Which parts of our trip sound the most appealing to you? September was a fabulous month. 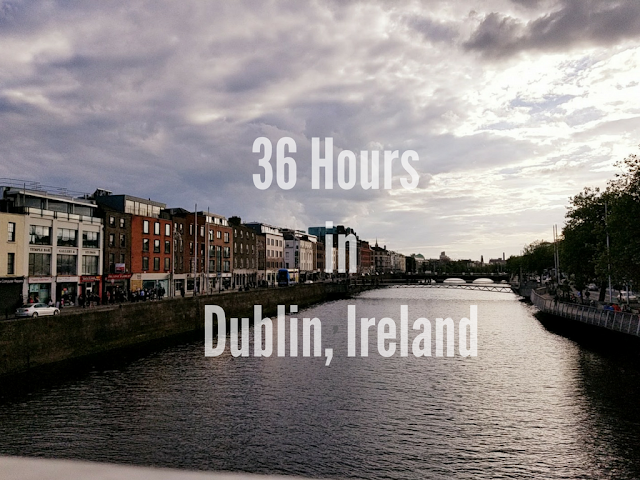 It started with a perfectly low key weekend after a full month of traveling and then went on one of the most incredible trips I've ever taken. The Pilot and I celebrated two wonderful years of marriage and we're finally feeling settled into our new apartment. Let's break down the month, shall we? In a month where I should have been getting close to a 50-mile week, this wasn't good. My training really suffered, but I had an incredible 12-mile run yesterday that I think will set me up for a great restart to training. I need to get back into the studio! 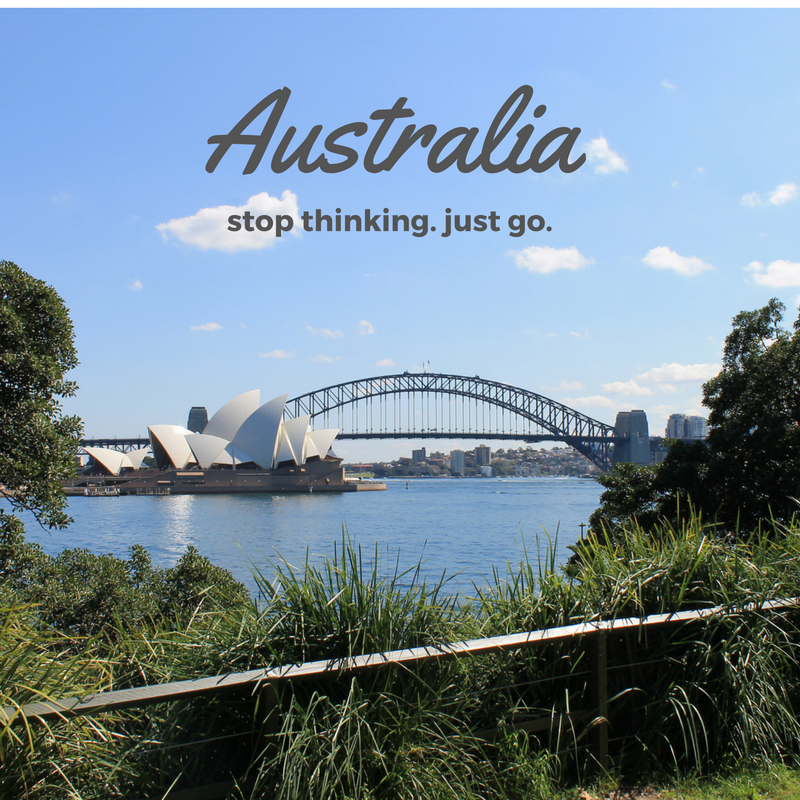 Trips Taken: 1 - Australia! Travel to another continent. The only one left now is South America...because I will never go to Antarctica. Celebrating two years of marriage with my Mister and traveling around Australia. 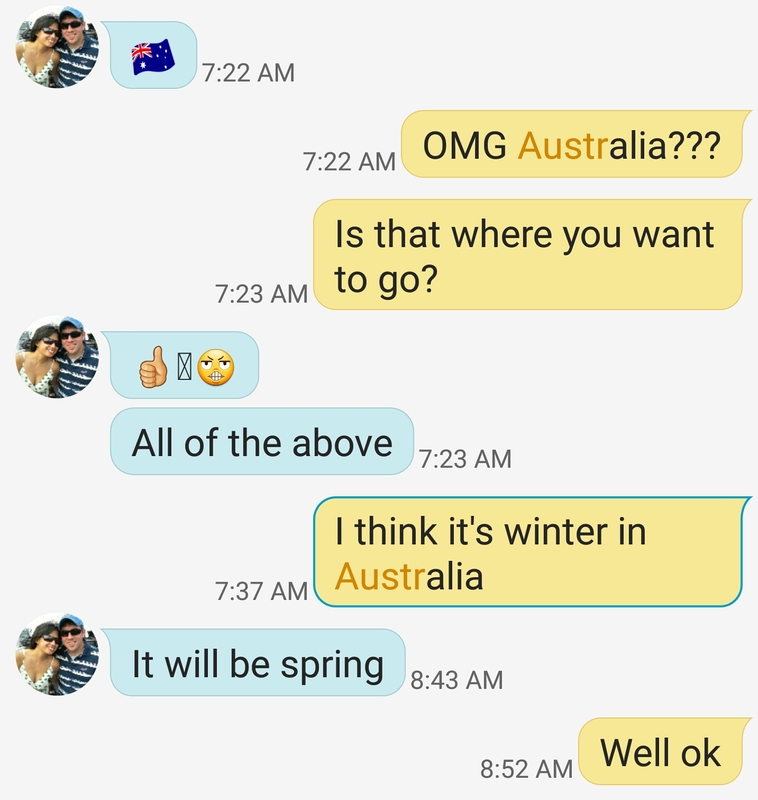 Coming back from Australia with a sinus infection that took 2 weeks to quit. I'm taking a girls trip with my big sister to support her documentary at a film festival! Other than that, the month will be pretty low key, which I definitely need after 2 months of constant travel! 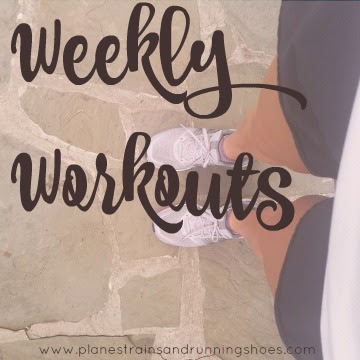 I'm hoping that yesterday's run is enough to get me back on track with Richmond training, and I'm hoping to spend a lot of time baking fall things! 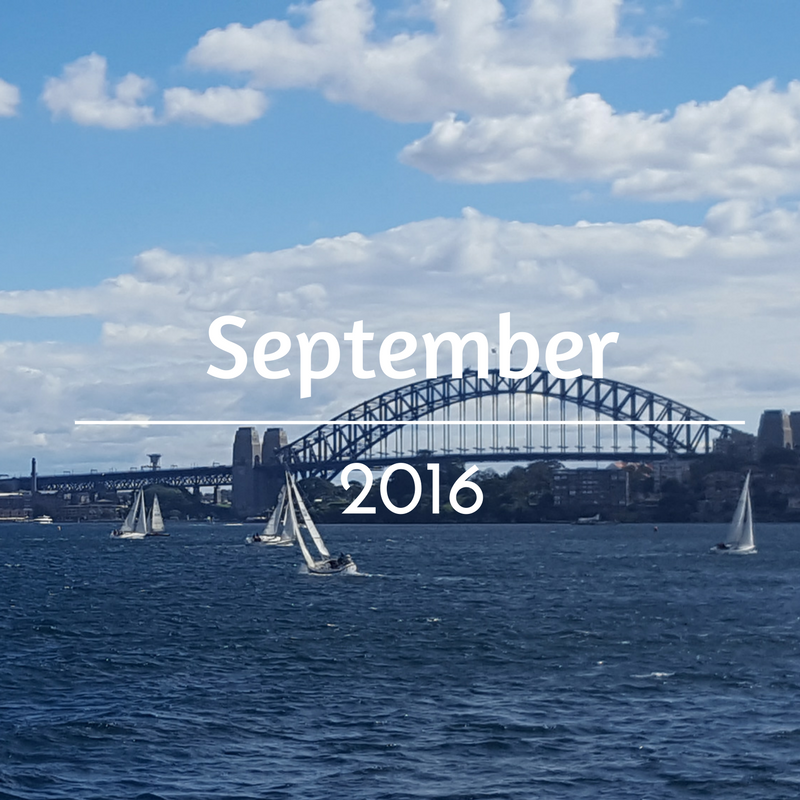 What were your favorite memories from September? Anything fun in store for October? Are you dressing up for Halloween?